I'm in California this week, hiking Joshua Tree, relaxing near Palm Springs, visiting the older boy at school, and trying to unwind, best I can. Rather than leave this space blank, as a non-crazy person would happily do, I thought I'd pass along a few examples of reportage from the Golden State, starting with this adventure, originally published almost 30 years ago. I winced a bit reading it — wordy — but hope the fascination of the place compensates for my artless description. Plus a reminder of the real challenges of finding a some locations in the pre-GPS, pre-Google Map era. LOS ANGELES — Whenever I'm in Los Angeles, I always do the same old things. There is the obligatory slow drive through Beverly Hills, staring in goggle-eyed envy at the pink sugar-cube mansions and extraterrestial vegetation. There is the beer break at Barney's Beanery, the browsing trip to Rodeo Drive and the meditative stroll on Santa Monica pier. The usual stuff. 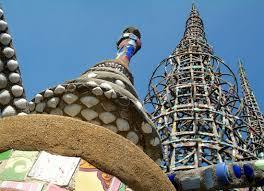 One thing I had never done, but always wanted to do, was visit the Towers of Simon Rodia in Watts. These glorious, elegant, almost surreal structures, hand-built by Rodia over a period of 33 years without welds, nuts, bolts, drawings or assistance, are internationally famous for their whimsical design and unique history. Described as everything from "the paramount achievement of 20th century folk art" to "petrified Christmas trees," they seemed like something that could provide a person with needed inspiration. Once I went as far as asking a hotel clerk for directions to the Towers. But the clerk's opinion of Watts, like almost everyone else's, had been set in stone after the rioting of 1967. He convinced me that going to Watts, for any purpose, fell into the category of Stupid and Dangerous Travel Ideas. 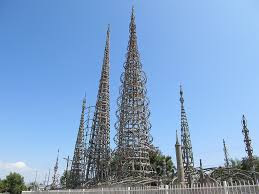 But this time, armed with a map of the city and the Towers' address — 1765 E. 107th St. — I headed for Watts, anyway. I even stopped for lunch and directions — at the first hamburger stand I've seen where you receive your food on a carousel made of bulletproof glass. But that was the only ominous aspect of the trip. I found 107th Street easily enough. Not knowing the way the numbers were laid out, though, I kept getting lost — the street always dead-ending or being cut off by construction. Several times I set my sights on the Towers in the distance, only to come closer and find they were electrical pylons or smokestacks. What I didn't know, but you now do, is that the Towers are south of Century Boulevard and east of Harbor Freeway. Eventually, making a U-turn on 108th, I caught sight of the Towers, unmistakable, looking very much like a pair of huge cypress trees shimmering in the warm air. I sped toward them. 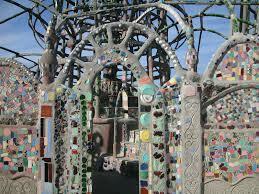 The Watts Towers are located on a tiny triangular sliver of land alongside railroad tracks. Made from cement and steel rods and chicken wire, they are decorated with a carnival of cast-off tiles, bottles, shells, china, mirrors and bric-a-brac, all set in odd arrays and patterns. The Towers were made by Rodia, an Italian immigrant tile-setter, beginning in the early 1920s and ending in the mid-50s. He intended them as a monument to America, his deceased wife and everything "good good." "You have to be good good or bad bad to be remembered," said Rodia, who died in 1965 and is definitely remembered. What touched me, looking at the Towers, was not America, Rodia's deceased wife, or the "good good." Rather it was the personal courage and determination it must have taken him to build the Towers. He didn't form a committee, or ask a lot of people what they thought of his project. He didn't talk much about it — didn't go on the talk shows, didn't write a book. He just built the Towers, on his own. When he was done, he deeded the land to his neighbors and disappeared, leaving the Towers as his own enigmatic statement. The Towers suffered decades of neglect and vandalism, not to mention the rumblings of earthquakes and the nearby trains. As late as 1978, the city of Los Angeles was still quibbling about whether they should be preserved. They are being restored now, and are closed to visitors. But that doesn't matter, because the best view of them is from across the street. The two main structures, just shy of 100 feet tall, are intricate fantasies of woven concrete, managing to be both free-form and roughly symmetrical. To the right of the main pair is a smaller tower, green with soda-bottle bottoms and connected by an arching lattice of supports. Tiny pieces of mirror glint in the sun, and the eye jumps from spot to spot, taking in the common objects, suddenly made monumental by height and repetition. Rodia's initials, as well as random dates, can be found here and there. The objects beg to be touched. One is compelled to put a finger in the tea-cup handles jutting out from the wall, to stroke the chips of cobalt-blue glass. Though the Towers will be closed for years, school groups are given tours inside the walls. You can join a tour — if one is going on — by calling ahead. A small cultural center next door displays artworks, mostly from local residents. Even more difficult than finding the Towers was leaving them. They seem so fragile and airy and out of place in rough-edged Watts that they beg to be looked at and thought about. 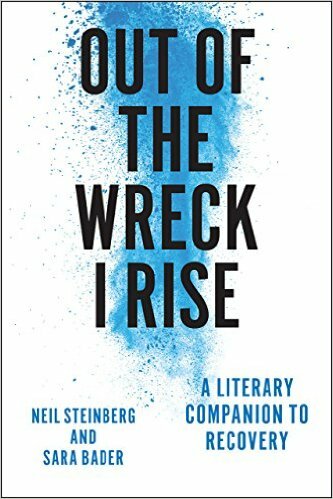 Turning for a last glance, I thought about Simon Rodia, finishing after 33 years, regarding them one last time, then walking away across the weed-choked, vacant lots. Seeing those towering palm trees made me think of the late December day more than a few years ago when I was seemingly teleported from the slushy cold streets of Chicago to the warm invigorating sea breezes of San Diego. I came to hate the unchanging boringly nice weather of Southern California, but that day was a taste of heaven. Take a trip to Howard Street, east of Western & you'll see several bullet proof carousels for food & cash. Many years ago, I lived in Twentynine Palms in California. The Joshua Tree park wasn't that far away and I recall spending one night there as part of a youth excursion. The stars are so beautiful and and sunset you could see hundreds of bats flying out to the night. California Week #6: Warning! Life carries risks! California Week #5: Even noble Homer dozed. "It can hit you like a bus"